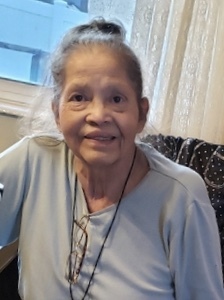 Andrea Medrano DuBois, age 69, made the trek to “Disneyland” on April 9, 2019. She unexpectedly passed suddenly and peacefully in her home joining her loving husband John W DuBois. She was born in Costilla, NM, on April 17, 1949 to Luis and Juanita Medrano. She was their third of nine children and moved to Grantsville when she was just a toddler. Our loving mother had a great adventure and lived a short time in Hawaii but knew Grantsville was her true home and eventually returned. It was during her work at the Tooele Army Depot where she met the love of her life John. They were married July 10, 1981 in Stansbury Park, UT. After they were married John and Andrea bought a house on Cooley street in Grantsville where they lived with their two daughters Angie and Cindy. Surrounded by loving neighbors they had a very happy family life for many years. There is a big celebration in “Disneyland” as mom is reunited with our dad, our grandpa Luis, grandma Juanita, uncle Ernie, aunt Karel, our uncle Johnny his wife aunt April and their son Jason, uncle Clarence and the baby of them all uncle Louie. As mom is celebrating with them, we are celebrating her life here with those of us that remain: Aunt Jenny Lou Martinez, Uncle Jimmy, Uncle Jacob wife Aunt Jennifer, Uncle Robert wife Aunt Kris, and Aunt Jamie Lee. Of course, her kids Angie and BA Valdez, Cindy and Wade Golden. She loved her many nieces and nephews as if they were her own children and her nephew Jeffrey would help her with yardwork and household chores. Mom’s pride and joy were her three grandkids Travis, Trevor, Jessica and her companion dog GinGin. Please join us in mom’s celebration of life on Monday April 15, 2019 viewing at 3:00 PM with services at 4:00 PM at the Hale Street LDS meeting house 428 S Hale Street, Grantsville, UT Interment Grantsville City Cemetery. In lieu of flowers please donate to your local animal charity on behalf of our mother that dearly loved all animals. Special thanks to mom’s personal healthcare team Joey, April, Rachel, Cat, Kelly, and Kevin and we are sorry if we missed anyone. Mommy loved and touched the lives of so many that we are so grateful for everything.